Becoming a parent is indeed a very different kind of feeling. The emotions that one feels are indeed difficult to describe. It makes one afraid, anxious, happy, proud and confused. It does leave one feeling incompetent and struggling to cope with the changing demands – physically, emotionally and intellectually. But beyond all this, it does change a person for the better. It makes one feel responsible, mature and changes the way we see ourselves, our roles in this world and in how we interact with our spouse and our friends. On this whirlwind, week-long tour of the US, I had the unique opportunity of seeing two young couples who recently became parents. As soon as I landed at JFK on the 18th afternoon, I knew that I would have the dependable Arun Karpur to pick me up at the airport. Arun has been an active SVYM member and has worked hard to set up and sustain the relationship with Cornell University. He has made a mark for himself in the Employment & Disability Institute of the Cornell ILR School and his well-known for his research knowledge and skills. He and his wife Radhika were blessed with a baby girl Aradhya, three months ago. Watching him talk and play with his daughter makes one realize how well endowed he is with skills other than research. Suddenly he seems so evolved and different. What awaited me at Shrewsbury, a city near Boston the next day was something similar. One always equated Satish (another SVYM member) to a life that is easygoing and devoid of anything stressful. He had a calm demeanour that could rarely be ruffled. Satish and his wife Manjula are dear friends who made my life so comfortable during my year-long study at Harvard. They were another couple who have a special place in my heart and I found them overflowing with joy at having had a daughter four months ago. Their daughter Chirantana seems to love conversing in baby language with anyone and everyone. Watching Arun and Satish share notes and update each other on how infants behave was like watching young children describing the new toy that they had just come to own! The Kennedy School and Harvard Square will always be a special place for me. The 20th morning saw Arun, Satish and myself drive down in the morning. While I went about my meetings at the school, the Center for Public Leadership and at the Hauser Center, Arun and Satish explored the Harvard University campus. We then had lunch with Melli Annamalai of ASHA at a Thai restaurant close to the Harvard Square. Melli is another dear friend who is very committed to improving the state of education in India. She hails from Mysore and has been supporting our various programs from a long time. She is very active in ‘Asha for Education’ and has been one of its Presidents in the US. We could catch up and discuss many programs and I also used the opportunity to update her about all that was happening at SVYM. I have always felt that nature has been very kind to the United States and the drive back from Boston to Princeton was scenic and pleasant. On 21st morning, I left very early to catch a flight from Newark to Minneapolis and the whole day was spent in meetings at the University of Minnesota. Teaching and having faculty positions in universities in the US has left me with a better understanding of the relationship that exists between teachers and administrators. Faculty is so focused on the academic content, while administrators are always trying to balance budgets and make things work. 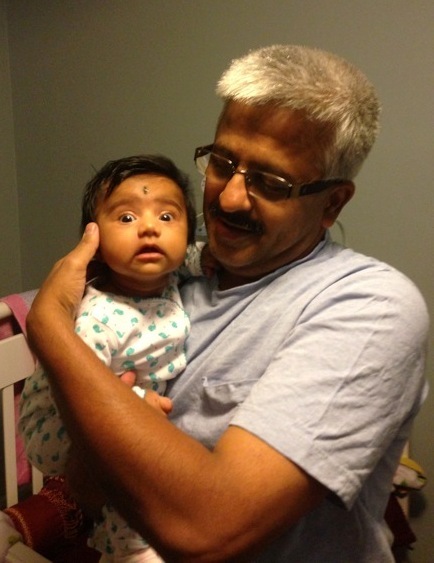 Another SVYM member in the US who continues to be engaged and involved is Shailendra Prasad, or ‘Shailey’ to his friends. His company is something that I cherish a lot and I always end up learning something new whenever I meet him, and this visit was no different. Staying with him is always enriching and gives the time to share notes on leadership – a subject dear to both our hearts. During the dinner he hosted, I could meet with Mark and Susan, the faculty and resident who will accompany the next set of students to our Vivekananda Institute of Indian Studies (VIIS). After more meetings at the University regarding new and upcoming programs in collaboration with VIIS, I left on the 22nd to Washington DC. Prof Govind Rao of the University of Maryland, Baltimore Campus (UMBC) met me at the airport and I stayed with him for the night. 23rd was another day of great learning. Visiting Govind’s Center for Advanced Sensor Technology exposed me to an altogether different world. Frontier Research is something that I have not been exposed to and it was so overwhelming to see so much that is happening in this domain. Govind Rao and his team are developing products that one would imagine belong to the world of science fiction. Seeing his lab and the product demonstration to the GE team left me with a better understanding of how things work in this domain. From ideation to proof of concept to product development and commercialization is indeed a long and expensive journey. One longs for India to also join in this pursuit to make human life better and the world a better place to live in. It is strange how we take our friends for granted and never really make the time to meet and interact with them when they are close to home. Ashish and Mikul were my classmates from the Kennedy School who work with the World Bank in New Delhi. 24th morning started with having breakfast with Ashish in a downtown bakery and catching up with old times. Lunch was with Dr Rao and his friends Vaidy and Srinivasan in an Indian Restaurant and we had to have the difficult conversation about the Premavidya project. A lot of water has flowed in this project over the last year and as donors, they needed to be updated. A lot of misconceptions that arise out of incomplete communication were cleared. Communication and Public Relations are not strengths of NGOs and SVYM is no different. Meeting with Dr Rao, a committed supporter, showed me how much more needs to be done. Mikul met me for a few minutes at the Union Station just before I boarded the train. I have never been able to come to terms with why train travel is more expensive than air travel in the US. I took the Amtrak Acela Express from DC to New York and was disappointed that the promised wi-fi never worked on board the train. The postponement of the Asha conference and inability to advance my travel meant that I had to stay with Arun over the weekend. This left with me with time to catch up on my work and writing. I holed myself up in Arun’s office, a true ‘den’ that permitted me to complete quite a bit of all pending tasks on the 25th. Arun and I then went to dinner at Dr Meena Murthy’s residence and made ourselves time for some shopping too. How could I return from the US without contributing my bit to their consumerist economy?! Every restaurant I go to, every flight I take gives me enough indication of the reviving American economy. In this age of globalization, this will have its impact around the world and one is relieved that things are indeed improving. Hopefully human greed will not reverse this again to 2008 levels. What stands out in this visit of mine is the inclement weather. Wherever I went, it was wet and raining. It was cold too with one minor exception. If it was 80 degrees Fahrenheit in DC, it was 45 degrees in Minneapolis. Everyone I met had the same explanation – climate change and its consequences. Hopefully, we will learn as a race to mitigate this and understand that every one of us has to participate in not destroying our precious environment and leave our future greener than what it is today. Traveling back to India is something that I have always looked forward to – reaching home to my family and loved ones. The flight today, the 26th of May, gives me time to reflect and be alone with myself. It also gives me time to catch up on another favorite pastime of mine – watching old English movies. I intend doing all this on the Emirates flight, an airline that I have come to like and depend on. India, I cannot wait to return and be amidst the excitement and energy, the challenges and problems, the opportunities and battles! Well, one has so little to give her, but then she gives back so much more.